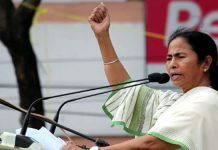 Kolkata, 25 May: CHIEF Minister Mamata Banerjee has accused Bangladesh government of constructing unauthorised dams on the upstream of three rivers that flow into South Dinajpur district in north Bengal from Bangladesh. Not only this, she has accused the neighbouring country of having increased the import duty on mangoes from Malda, causing a sharp decline in demand from Bangladesh and in turn causing losses to the mango growers in the state. She flagged the issues during a meeting with Prime Minister Narendra Modi in Delhi and urged him to raise the matters with his Bangladesh counterpart. “Dams have been constructed on Atrey, Punarbhaba, and Tangan rivers without any consultation with India and for that matter Bengal. As a result, during lean season farmers in South Dinajpur are not getting water for irrigation, while during monsoon Bangladesh releases water from these dams leading to flooding in our side,” she told newsmen after meeting the PM today afternoon. 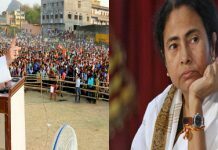 Bengal CM has flagged the issue at a time when there is immense pressure on her to give nod to the Teesta water sharing agreement between Indian and Bangladesh that is hanging fire for over four years now due her objection. Banerjee’s argument is that giving Bangladesh a higher share of Teesta river water will hit farming in the north Bengal plains. The move is being viewed as an attempt to build up a counter pressure on Bangladesh as Mamata Banerjee is being accused of blocking a stronger bond between the two countries. 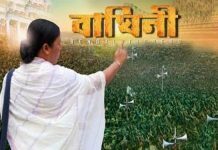 She further informed that she has urged the Prime Minister to restructure Bengal’s debts to facilitate development work in the state, and release Rs 8,000 crore that is due to Bengal as Central share in various projects. The Chief Minister is scheduled to attend a meeting of Opposition leaders that has been convened by Congress president Sonia Gandhi at 1 pm Friday to pick a consensus candidate for the Presidential election due in July.